2 August, 2011 13:18 | Dish It Out! Mmmmmm, last day on Cape & back to So Coast Local, Mattapoisett. 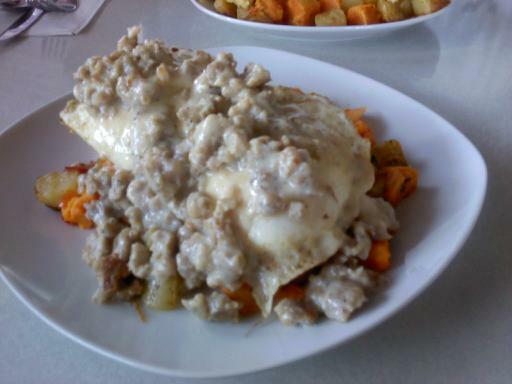 Today is Colin’s Man Of Steel;bacon/cheese muffin with 2 eggs over easy, sausage gravy, & 2 potato homefries. Posted on August 2, 2011 by tonyspats	• This entry was posted in Uncategorized. Bookmark the permalink. I gained 10 lbs just looking at that.